"It Has A HEART And A MIND!" Comics! Sometimes They Are Dissolute. Come Sir, or Madam, set yourself beside this hearth and join me in a snifter as we peruse a periodical of low-repute and learn of a very naughty home, a most naughty home indeed! Centuries before The Nazarene Castle Ragemoor fed upon pagan blood and grew. Without the hand of man Castle Ragemoor found shape and substance. Now Castle Ragemoor sleeps a dark sleep. Now interlopers have invaded its walls with profit in mind. They have brought with them man’s base nature and awakened the dark appetites of Castle Ragemoor itself. Appetites that only the interlopers themselves can sate. Castle Ragemoor stirs and hungers and whatever walks within Castle Ragemoor walks alone (and probably has very large secondary sexual characteristics). One needs only the most cursory of acquaintances with the work of Mr. Richard Corben to realise that he is partial to The Gothic, to The Horror. Throughout his career it is a genre he returns to again and again. He has produced numerous adaptations of the works of such lurid luminaries as Mr.Poe, Mr. Lovecraft and Mr. Hope Hodgson and RAGEMOOR shows he is not above creating such works from whole cloth, aided and abetted in this latest endeavour by his common collaborator Mr. Jan Strnad. Mr. Strnad sets the scene simply and elegantly for it is a simple scene to set for it is a simple story; one of greed and gory. It must have been tempting to lard great globs of prose most purple over the art. 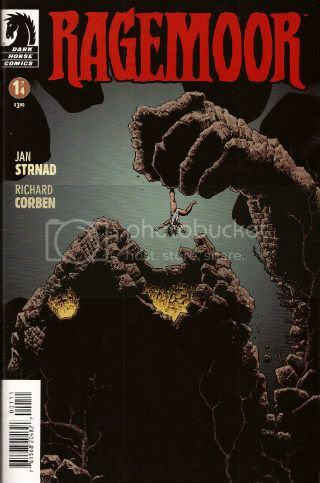 It would have probably failed to harm the work but Mr. Strnad resists this inclination, instead leaving the characters to reveal themselves through dialogue, actions and Mr. Corben’s singular art. 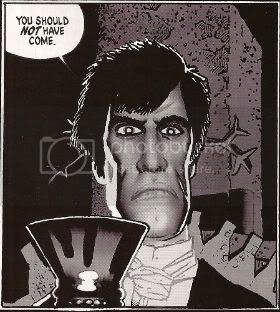 For Mr. Corben's art is indeed most singular. Its most singular aspect being in the nature of its excess. Fat people are not just fat they are bloated, the repressed are not just repressed they are practically frozen, the bosoms are not just large they are monumental and, aye, gravity weighs heavily upon them. Mr. Corben's art is exaggerated to the very brink of parody, indeed the very edge of tastefulness. Given the genre this is fitting, this is meet. Given the primacy of Mr. Corben's visuals when considering the low-born medium of this comical periodical it would seem most just to refer to the debased shadowplays of the Hammer and American International Pictures studios of days now dead. Films that beneath staid surfaces fair roiled with debauchery, degradation and decay. Films that displayed a society whose grandeur had passed its peak and was now spotted with rot. A society where Man could hide his decadence behind piety but never from forces older than Man's God. Such vengeful forces as are embodied, quite literally, by Castle Ragemoor itself. Castle Ragemoor is a massive edifice cosseted by shadows without and decorated by darkness within. Mr. Corben chooses to err on the side of suggestion and minimalism in much the same way that Roger Corman’s Poe films did. 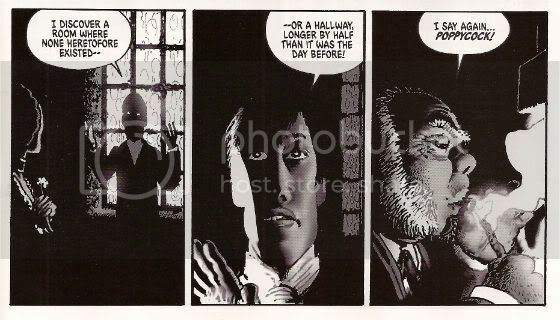 Although Mr. Corman’s inventions were spurred by budgetary constraints Mr. Corben’s budget is unlimited and yet he still chooses to nail each interior scene onto the page with great slabs of black. One can only surmise that these deep, dark walls of nullity are intentional. Characters are fixed within settings of stark darkness which fade to grey at times revealing surroundings warped and flaking with age. Where there is light, and there is light upon occasion, it flares its brightest at times of violence. Only from the illumination provided by the violence of flame, of storm, of a new day being born does the darkness of Castle Ragemoor recede. But it only ebbs to reveal a scene of implicit or explicit horror and while,yes, near pages' end the sun’s light gains ascendancy it is only a brief respite as darkness moves in from the edges of the final panel, remorselessly reclaiming Castle Ragemoor. For Castle Ragemoor is a dark place because Castle Ragemoor is A Dark Place. This darkness is fitting, this darkness is meet. Indeed to the uncharitable reader RAGEMOOR could be dismissed as mere homage, mere pastiche, but could only be dismissed entirely as such by one who feels both terms are themselves lacking in value from the off. And yet, and yet, is it not oft-times a case not of what has been done but how well that thing has been done? Given that your author has a weakness for both pastiche and homage he finds RAGEMOOR has been done very well indeed and is thus compelled, though it be an affront to nature and The Lord, to accord it a most boisterous VERY GOOD! Have a most blessed weekend all and in the name of the one true God I implore you to read some COMICS!! !